The Book Club tells the story of Nigel and Ellie. Nigel lives alone, going about his daily life, with little thought for much beyond his garden fence. Until one day, Ellie arrives on his door step, offering a monthly book club subscription. Every time Ellie returns, Nigel attempts to impress her with a new outfit or act. Of course, this does not entirely go to plan. The Book Club is a story of love and friendship, but it carries a deeper message, about staying true to oneself. Tobias La Montagne is a musician and award- winning filmmaker. 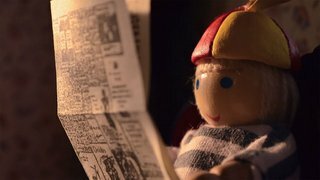 His Stop Motion animated short film The List was shown at the 2017 Scout Film Festival and received Grand Prize and Audience Favorite award at the 2015 Ashfield Film Festival. His sequel to The List, the Stop Motion animated short The Book Club received Grand Prize and Audience Favorite award at the 2017 Ashfield Film Festival. He has garnered accolades from The International Youth Silent Film Festival where his film The Blue Box, made with filmmakers Annie Matica and Elias Konturas for their company Vast Walk Films, was a finalist. La Montagne is also the owner of Zap! Film LLC, a video and media production company. La Montagne also writes and performs original music with his band Parlicium. They have performed at the Green River Festival, Three County Fair, Ashfield Fall Festival, GoshenRocks, The Valley Sessions and Bratt Rock, among others. He lives in western Massachusetts with his family. Read the full Q&APBS Spoke with Writer, Director, and Animator Tobias LaMontagne about how he brought his intricate stop-motion set to life in eight months. Operating out of the Riley Broadcast center in Wixom, Michigan, Detroit Public TV publicly serves the nation's 11th largest television market. DPTV hopes for a community that people trust public media to facilitate new ideas, make decisions and enjoy enriched lives. DPTV provides local programming that airs culture, art, news and educational outreach campaigns that use the power of media to provide knowledge and understanding.